How great has this week been? 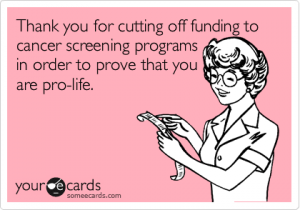 When I first heard about the Susan G. Komen Foundation eliminating funding for the breast cancer screening services that Planned Parenthood provides to poor women, I was shocked. I took to my blog, Facebook and Twitter to express my dissatisfaction as did a lot of people. I sent them $50 and others sent them 2,999,950 more. I wouldn’t have been surprised if that was it. Over the next few days, the mob got louder and angrier, and they kept it up. It got so bad, that today Komen apologized and stepped back (albeit a little) from their original plan. It’s a testament to the power of an angry mob. What amazes me, is that companies and organizations continue to make the same mistake. First there was Lowe’s, then there was SOPA and now the Komen debacle. You’d think they’d learn. The damage to Komen’s brand and reputation may be irreparable. This controversy has forced many people to take a deeper look at them and what was found wasn’t pretty. The founders of Komen have been found to be big GOP donors. They had no issue putting their brand on pink guns,and a new part of their management team is a major anti-abortionist. Many of the supporters they lost this week will not be coming back. At the end of the proverbial day, I’m happy this happened. Planned Parenthood collected $3 million to help people who need it the most and we know what the Komen Foundation really is. And the internet and social media has become of age as a tool of mass activism. Pick a side, everyone else has. The partisan attitude that has infected our politics and ruined any hope of partnership in Washington has spread throughout the country. There is no better example of this than the fact that I now have to choose my charities based on their politics. This is what the Susan G. Komen’s decision to defund Planned Parenthood means to me. From now on, every time I see a pink ribbon on the back of a car, a pink bat in Major League Baseball, or pink sneakers in the NFL, I’ll see pro-lifers and their rabid attack on women’s health. Judging by the outcry on the internet, I’m not alone. I’m not sure that the Komen Foundation expected this. By choosing to side with the right on abortion, they have forced the hands of anyone that is pro-choice. My simple solution: any charity that is attacked by the right, is now on my list to support. 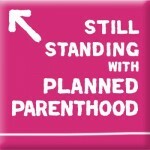 As such, I sent donations last night to Planned Parenthood and National Public Radio.